LeAnn (in pink) and Robin (to her right) gave us Chicago tips. 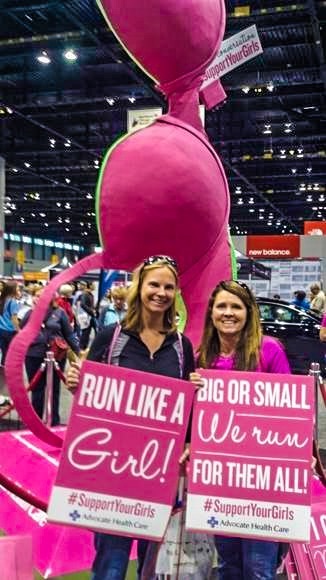 On Sunday October 12, 2014, two Athletchics we know, Robin Smith and LeAnn Parmenter, completed the Bank of America Chicago Marathon. For those of you who are marathoners or those contemplating taking that step into the 26.2-mile world, both Athletchics recommended this as a “must-do-in-your-lifetime” marathon. 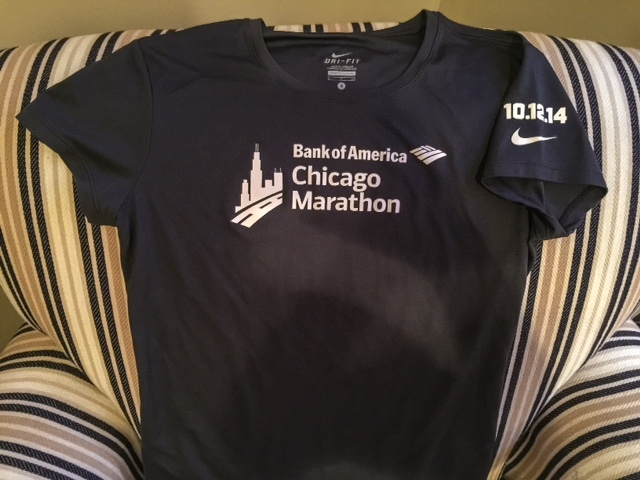 Chicago was LeAnn’s second marathon and Robin’s 62nd! Hence this post reflects the rating of a newbie and a seasoned runner! 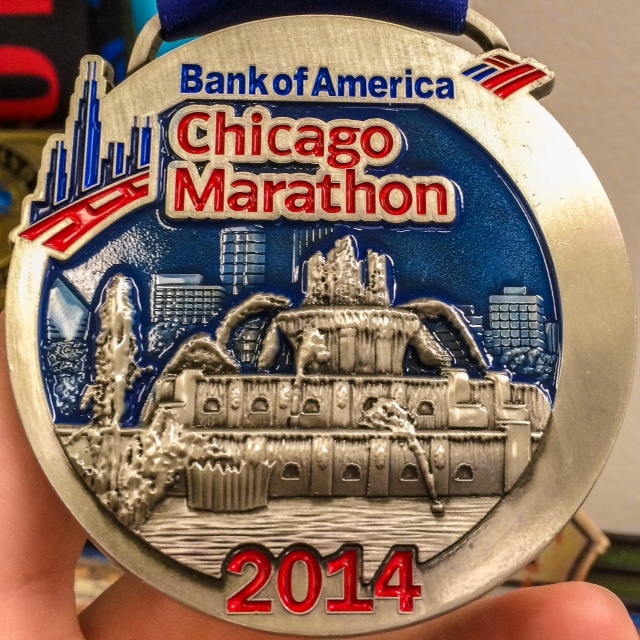 As Robin put it, hold on to your hat, this marathon cost $185 dollars for US residents and $220 for non-residents. But don’t despair, the girls tell us it’s worth it. Registration is a little trickier than most as it is a lottery. If you’d like to participate for charity or are fast (under 3:15 for men or under 3:45 for women), you may be automatically accepted. All others must register for the lottery on March 10th or after at the Chicago Marathon Registration site. But hurry! It closes in April. We rated this high because both girls said the magic words: a lot of freebies! The location was great. There were several downtown hotels where buses brought you to and from the expo. Merchandise and vendors were plentiful. Packet pick up was quick and easy. 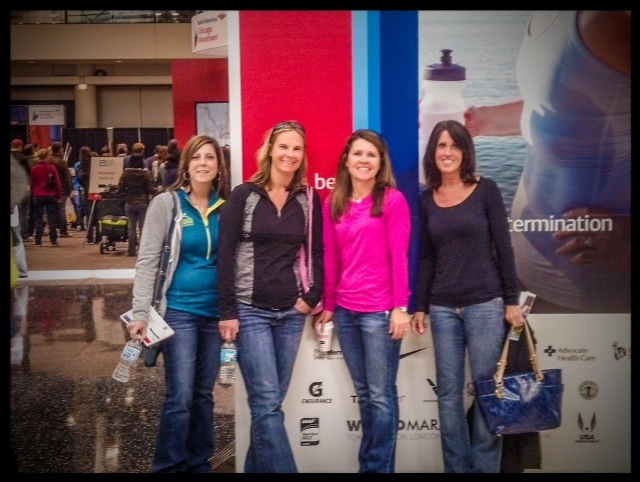 LeAnn said because there were 45,000 runners, they expected long waiting lines at the expo, but the lines moved fast. Both runners loved the merchandise—especially Nike and North Face. Other perks? Nothing like a pic with friends in front of a big pink bra for Athletchics or free beer! This year they received a Nike Dri-Fit short-sleeve t-shirt. Both girls said the shirt ran small. Robin said it was ok, and LeAnn said it was her only disappointment for the entire event. 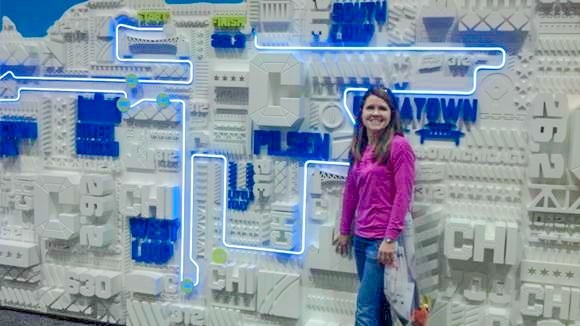 Robin said the Nike Chicago store downtown (699 N. Michigan Ave.) sold finisher jackets the morning after the race. They had a huge variety of short and long sleeve t-shirts, jackets and other cool merchandise. But don’t limit yourself to the expo and Nike Chicago. Robin said the shopping in downtown Chicago is fabulous. 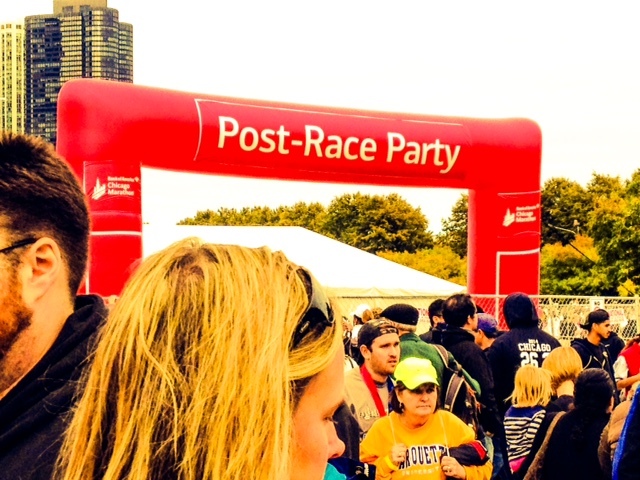 Both girls loved the course, and if you click on the view results of the Chicago 2014 Poll, you’ll see marathoners rated running through the 29 Chicago neighborhoods as their favorite part of the 2014 Chicago marathon. Robin said it was fast and flat, with no major hills, just gradual upgrades and a lot of turns to break up the course. 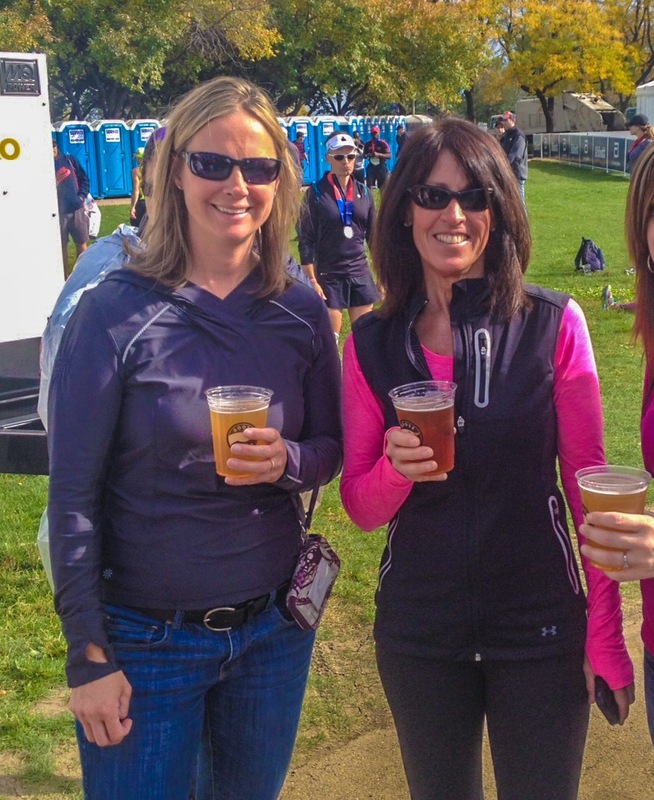 Despite 45,000 runners, both girls said participants were relaxed and happy. They were surprised how little congestion there was. They gave kudos to the ease of access of the marathon starting corrals which influenced the smooth start. Robin said it was well organized, and since she had 61 marathons to compare this to, she would know! LeAnn said she expected it to be crazy getting anywhere or having room to run, but it was surprisingly easy. She did say, since there were four of them in her group, staying at a hotel fairly close to the start/finish made it convenient for them to find their different waves. 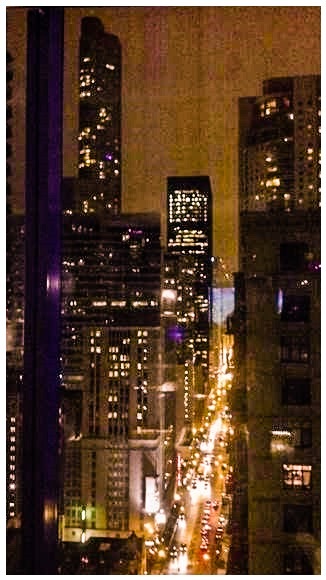 (Not to mention the view of Downtown Chicago at night.) They could see the corrals from their hotel room. Both said it was worth the extra money to stay downtown. This gets high accolades from both runners. Robin said the crowd was amazing and the entire City seemed to support the race. They held signs, clapped, cheered, handed out candy and water. LeAnn wore an “Erie” hometown shirt and said the crowd cheered “go Erie” all the way. She loved the hand outs and said it was like trick or treating. She ate jolly ranchers, snickers bars, twizzlers and anything else the crowd offered. 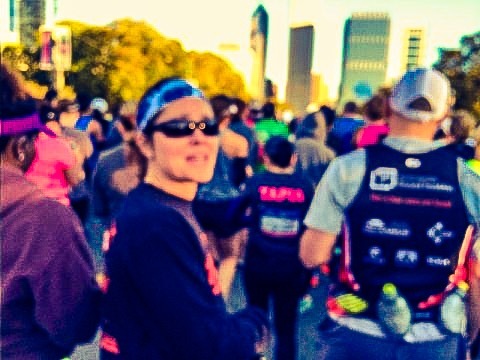 (Athletchic ran with LeAnn on her first Marathon and can attest to her marathon munching.) She said most of her Chicago marathon pictures showed her with chipmunk cheeks full of candy. Robin said there were fewer spectators at the finish than on the course, but that the finish area was well organized and the volunteers were friendly. The park was easy to enter or exit. Both marathoners loved the medals and the post race party. Finishers could walk up to a table and have their times printed out. Chicago is just a great place to have a run. The big-city crowds, waterfront, towering buildings, and bridges all add to the ambiance. LeAnn said the after-party was fun, but celebrating later that evening in Downtown Chicago on a roof top bar with friends was something she’ll always remember. For those who had to head out of town quickly, organizers made it easy for them to obtain their finisher’s certificate. They just entered their bib numbers at the finisher certificate site and printed it out! They also had a great indexed on-line guide to help participants and spectators get their bearings. It broke information down into expo, start, finish, course, spectator information, places to stay and just about anything else you had questions on. They have a Facebook page to keep participants updated and a Nike training program that touts training schedules for beginners, intermediates, or advanced runners.